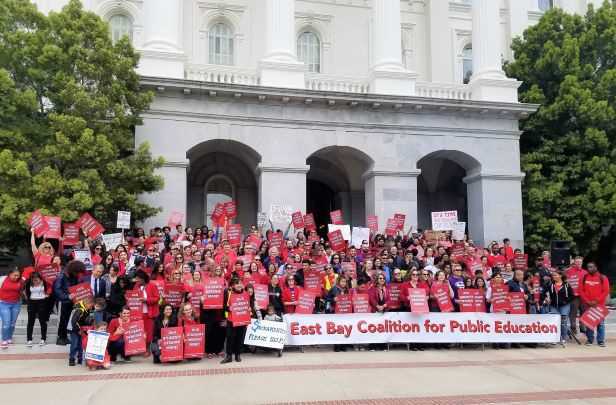 The unified front also talked with legislators about the fact that California’s education funding crisis has been decades in the making and is deeply rooted in the capital city. “The true fight is not between teachers and management — it’s between schools, communities, students, families and the legislators in Sacramento,” CSBA Senior Director of Communications Troy Flint said in recent comments to The Nation. Those on hand at the Capitol voiced their support for Assembly Bill 39 (Muratsuchi, D-Torrance). The legislation would increase the Local Control Funding Formula base grant targets to equal the national average in per-pupil funding. Adjusted for cost of living, California is currently ranked 41st nationally in per-pupil spending. Beyond supporting the setting of targets by co-sponsoring AB 39, CSBA is leading the charge with its Full and Fair Funding campaign. Despite boasting the fifth-largest economy in the world, California sits near the bottom nationally in nearly every significant measure of school funding and school staffing. Full and Fair Funding directs the Legislature to raise school funding to the national average by 2020 and to the average of the top 10 states by 2025. Castro Valley USD student board member Alex Kwan said districts are facing too many burdens without the resources to address them. The Legislature’s continued reluctance to adequately fund public schools will only harm society’s future leaders and the state’s thriving economy in the long run, he added. “Full and Fair Funding is not only in the best interest of the public, but in the best interest of the government as well,” he said. While some analysts and legislators point to the fact that Proposition 98 funding is at an all-time high, the amount of money districts are receiving only brings them back to pre-Great Recession levels. The recently published Getting Down to Facts II report found that an additional $22.1 billion would have been necessary to ensure all students had the opportunity to meet the state’s education goals in the 2016–17 school year.